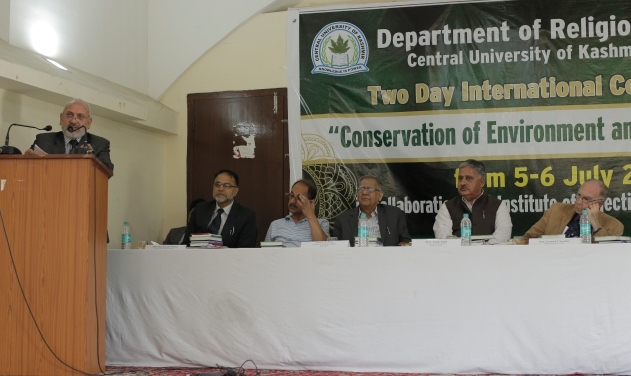 of Environment and role of religion” began at Nowgam Campus-I of the Central University of Kashmir (CUK) on Wednesday. The Conference is being organized by the Department of Religious Studies, CUK in collaboration with the Institute of Objective Studies, New Delhi. Academicians and experts from different parts of the world are participating in the conference. different socio-religious backgrounds are sitting under one roof that has been the illustrious tradition of Kashmir." Highlighting the role of religion in preserving human values, Prof. Mehraj ud Din said that religion has a vital role to play in safeguarding the environment. Prof Lenord J Swidler, Temple University, Philadelphia, USA, Mufti Mustafa Ceric, Grand Mufti Emeritus of Bosnia, Prof Z M Khan, Institute of Objective Studies, New Delhi, Deans, Heads and Coordinators of the varsity, Professors of CUK, Professors of University of Kashmir, religious scholars, environmental and social activists, scholars and students of various departments of CUK. In his Keynote address, Prof Lenord Swidler laid the emphasis on the significance of dialogue in human society. He said, "If we look at it keenly we will find that the whole Universe is in the constant state of dialogue between mass and energy." Further emphasizing the need for dialogue for solving the problems that humanity is facing today Prof Lenord said," Nobody knows everything about anything, therefore, dialogue." He made the audience to repeat these words with him acouple of times. In his welcome address Head of the Department of Religious Studies, CUK Prof Hamidullah Marazi underlined various critical themes of the conference and welcomed the local and the foreign guests. He thanked all the guests and especially the Vice-Chancellor CUK for his supportin conducting the conference. Grand Mufti of Bosnia, Mufti Mustafa Ceric highlighted the importance of purification of the human soul in order to solve the problems like environmental pollution. He said, "The question of the environment is the question of all questions in our times but when we talk about the environmental pollution we have to understand it is one of the off shoots of the pollution that we have created inside ourselves." He said that the man's greed to possess nature is leading to the destruction. The Grand Mufti blamed the power imbalance in the world for the ills. He said, "Dialogue is no doubt is necessary for our survival but those who are powerful don't care about the weak and the weaker section cannot initiate the dialogue." Mufti Mustafa further said, "We are living perhaps in the deepest moral crises of all times because when we know what we are doing is wrong and we are still doing it that leads to strong moral crises." Suggesting a way out from the crises Mufti Mustafa said, "Each one of us needs to build his or her own Noah's Arc and that Arc is to cleanse our souls." Rector Darul Uloom Bandipora Mufti Nazir Ahmad Qasmi also spoke on the occasion. Mufti Nazir quoted from the Holy Quran and Hadith and draw home the point that Allah has directed human beings to use natural resources judiciously. He said, "Conservation and preservation of water and other natural resources is a religious obligation for all mankind and not complying is a violation against the compassion of the Creator." Dr Z M Khan from Institute of Objective Studies, New Delhi said, "We are not the owners of this nature, but have been made the trustees only and it is imperative to use the natural resources with the highest sense of responsibility." While speaking in the function Vice-Chancellor Central University of Jammu Prof. Ashok Aima said, "It is high time that we start to create the public ownership of our natural assets for our posterity that is how we can preserve our precious natural wealth." Dean Research and Development, CUK Prof Mohammad Aslam also spoke on the occasion and said that mankind has a duty towards the nature that is to be fulfilled at all costs otherwise the disasters are inevitable. A book release ceremony was also held at the occasion in which books of Professor Hamidullah Marazi, Dr Showkat Ahmad Shah and Mr Maqbool Ferozi were released. The dignitaries present on the occasion also felicitated Alhaj Manzoor Ahmed Wangnoo, Chairman Nigeen Lake Conservation, Dr Naseer Ahmad, Chairman Dr Naseer's Group of Unani and Panchkarma Hospital, Abdul Raheem Bhat, Chairman Raheem Greens, Dr Sheikh Gulam Rasool, RTI activist and Arif Shafi Wani, Correspondent Greater Kashmir for their contribution in the field of environment protection. Vote of thanks was presented by Dr Mued uz Zafar and the proceedings were conducted by Dr Showkat Ahmad Shah, both Assistant Professors at the Department of Religious Studies, CUK.